The Town of Babylon in recent years has become a leading promoter of green buildings. As one of the first towns nationwide to require LEED certification and the integration of sustainable building practices into new development, they find themselves at the forefront of innovation and sustainability, both locally and nationally. 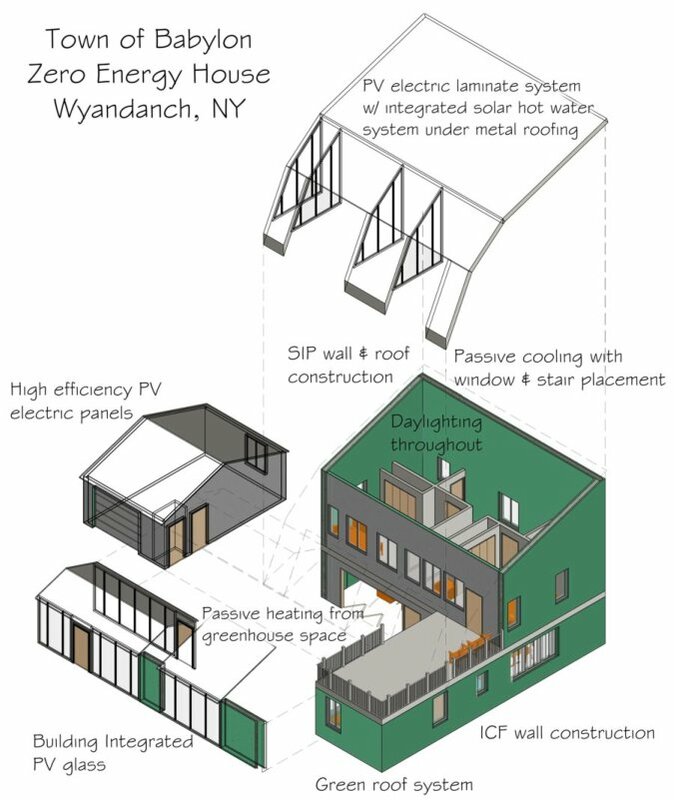 Working with Babylon we designed a zero energy home, that is a home that, along with its occupants and users, creates the same amount of usable energy on-site as is needed to run the home. The home is also designed to achieve LEED for Homes Platinum certification. The intention was that the home would serve as an educational tool for the community before being committed to local families in need as temporary housing with the occupants changing periodically. The two story home uses both passive and active design and energy strategies to meet its goals. A number of passive design strategies and energy efficient measures ensure the homes energy demand is low from the start. This is achieved with a super insulated building envelope, using both Insulated Concrete Forms (ICF’s) and Structurally Insulated Panels (SIP’s). 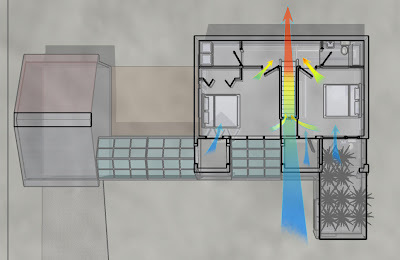 This type of construction minimizes air infiltration and leakage optimizing energy efficiency while maintaining comfort within. 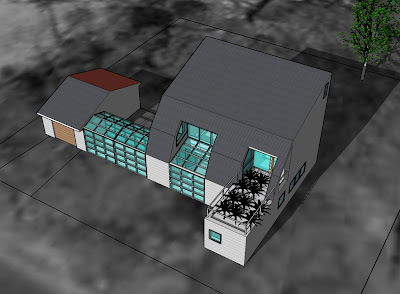 A greenhouse that extends along the homes south facade can be opened to the interior spaces or closed off depending on the time of year and the occupants desires. Not only does this space provide an area to garden year round, it also allows passive heating. 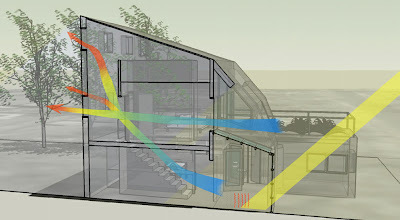 The greenhouses connection to the central stair helps to facilitate natural ventilation to help cool the house in the summer using the stack effect. This, along with properly sized and placed windows, and overhangs, increases the homes comfort while reducing its need for heating and cooling. While these passive strategies greatly reduced the homes energy demand on-site renewable energy was needed to make the home truly zero-energy. Careful calculations were necessary to size the homes solar array using a variety of technologies to run the energy efficient appliances, lighting, and mechanical systems. In addition to the homes impressive energy performance it offers flexible spaces that are comfortable and, with the inclusion of a small green roof, deck, and greenhouse, connected to nature and the community.